your home, and they may chew their way in. If we see that your attic is soiled with animal waste, urine, droppings, food, nesting material, fleas, or other parasites, we will offer attic cleanup services. We remove all of the waste and soiled insulation, we fog the whole attic with a special enzyme-based cleaning agent that will kill all the bacteria, parasites, and pathogens, and we leave your attic good as new. To the left is my biohazard suit and atomizer, with which I fog the attic with BioShield cleaner. It is rarely needed, but if your attic is so bad that you need full insulation replacement, I can work with your insurance and a contractor to get the insulation replaced. 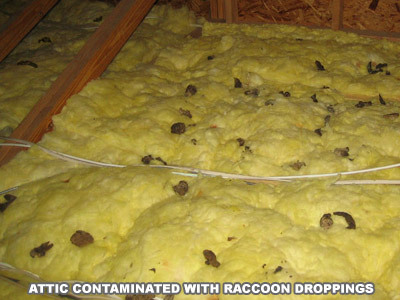 Attic animal removal and cleanup- There are a lot of different animals that will make a home out of your attic. Each and every one can cause some serious damage, though some are more of a health risk than others. Rats, mice, and squirrels are the most common nuisance animals found in your upstairs areas. Rats and mice can be dealt with through the use of snap traps, but squirrels should be captured and removed with one way door traps or repeater traps. Larger animals, like raccoons, opossums, and certain large birds, require a more advanced method of trapping. If you’re not comfortable live catching these animals, you should call a professional and have them see to the job. There are many potential complications, especially with raccoons, and some states don’t allow just anyone to trap them. Removing the animal is only the first part of the process. Once it’s gone, you need to immediately repair the damaged part of the home that allowed the creature access. Now that no new pests can get inside, your next worry is how to clean the space. The droppings of most animals contain harmful pathogens for people. 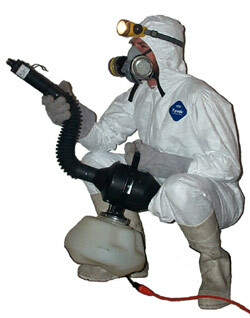 Be sure to wear proper protective clothing and equipment when cleaning your attic.